You can search and apply for jobs without using a computer. Taking it a step further many apps for your smartphone will match you with open jobs and save you search time. Which apps should job seekers use to give their job search a boost or to easily find the best talents and offer them job? Finding the best app for this it can be quite hard. Luckily for you, we did our research and we found the right app for you. Let’s talk about this helpful app. What is this app exactly? Developed for IOS and android users, very easy for using and highly efficient, this entertainment app is especially created to help its users to quickly find competence around the world without any effort. With the help of this practical app, users can find everyone they need easily and fast or even let other users find them for their skills and talent. The app allows them to search for talents globally or locally, using this exciting journey of talent network and social competence. Users can find people and let people find them, spending as many time as they want on their passion, working whenever they decide. With the help of this effortless app, users can use the simplest way for finding users for their skills and talents or let other users find them and ask for their talents. On the app, users can use the endless filtering system and screen millions of users while deciding which of them they want to match and work with. The app is offering them to search for talents, charity and competence, or to be found based on their own skills and talents on this amazing global network. Allowing the users to work on their passion, this app is easily matching every user with potential and suitable jobs or tasks, offering them to share experiences among each other and build a global network by themselves. The app’s chat is offering users to communicate with their matches or friends. 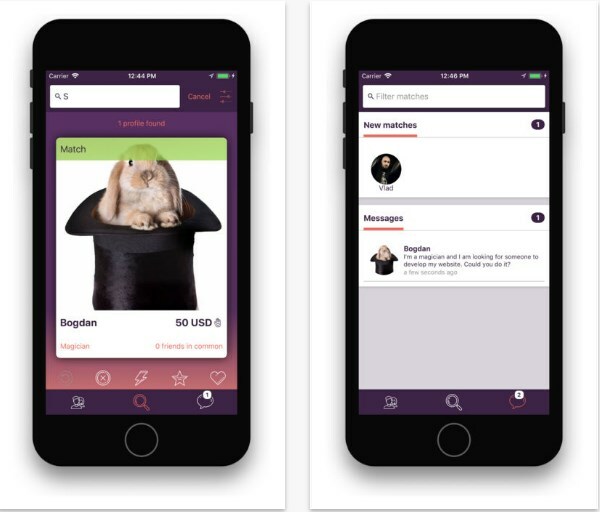 Also, users can choose to boost their profile and buy additional priority swipes to get the job done faster and easier or even get the premium version of the app for searching globally with unlimited swipes. Download this app on Google Play and App Store now for free.